Just yesterday we received a postcard from Gladis, the little girl we sponsor through One Child Matters. I keep falling in love with her. Her card was so sweet. She’s too little to write herself, and you could tell that she was telling someone what to write. What was the present we sent? 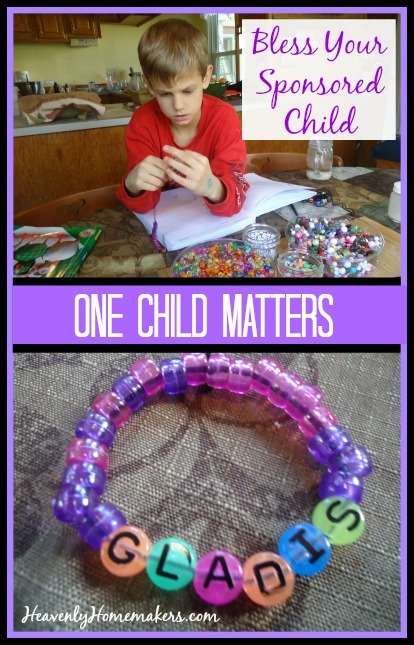 Last fall, Malachi and I made her a bracelet. We went all out with pinks and purples. I couldn’t help myself. Malachi was so sweet and loved making this for his “little sister-friend” in Honduras. Writing and sending letters to your sponsored child is such a meaningful way to connect with them. Including little gifts is also a lot of fun and always blessed the child, not to mention, it always gives us such joy to share what we have. When our family was blessed to spend a day at the One Child Matters in Colorado Springs last year, we got to spend several hours sifting through sponsor correspondence. We checked to make sure ID numbers were on enclosed items, and readied them all to be sent overseas. It was so much fun (and a little tear-jerking to me) to see all the sweet love going out from sponsors to their children. With our newest letter heading out to Gladis, I plan to print off some coloring pages for her – seeing as she likes to color. :) That should ship well and be fun to receive. What items have you sent to your sponsored child? If you’re not yet sponsoring a child, please join our ministry here at Heavenly Homemakers!